For those acclimatised to Boult's often stately tones in the later EMI set, these Barbirollis will come as a jolt. Barbirolli has no inhibitions about breathing passion into the pages of the two symphonies. The Pye tape of No. 2 has been out of the catalogue for years. This restoration, courtesy of Michael J Dutton, is exemplary. The performance has a considerable exuberance and tension which is cuttingly felt in the Lento - Allegro Molto. Barbirolli's passion, convulsive response and dramatic vision are never in doubt. Listen to the way he chases and goads the tempo in the first movement at 7.03. Boult's vision is not as vivid as this - whether in the 1950s Decca monos or the 1960s/70s EMI stereos. Listen also to the premonitions of Dona Nobis at 8.53 in the first movement. The massed violin tone suffers slightly from a hollow thinned out tone when the playing rises to climactic address. Barbirolli delivers No. 8 (which was written for him) with molto espressione. This tape was issued early on in the life of the CD by the PRT company who perpetuated a long-lived Pye Golden Guinea (GSGC) LP coupling with Bax's Fand and Butterworth's Shropshire Lad. Dutton have recently restored the Butterworth and Bax to the catalogue. Close up, the grain of the Cozart and Fine (the Mercury team) taping (almost half a century old) tells in the rawness of the string sound. Nevertheless the analogue tape still has astounding bite, richness and resonance. Its downside is a zoomed-in approach with instruments cosily spotlit in sound that must have dallied with saturation level in the ferric oxide stock of the time but which steers just the saints' side of disaster. I was brought up short in a way that no other recording has done when listening to the scherzo. We know that VW kept his faculties lively in engaging with others' music as well as his own. At 1.10 the strident woodwind strongly point to Shostakovich of all people! This is a lovely and caring performance of a symphony that is so much more than just a showcase for an assemblage of 'spiels and 'phones. The set is lent further authority and attraction by a RVW/Barbirolli discography and by notes from Michael Kennedy. One small but artistically virtuous point.The gap between the epilogue of No. 2 and the start of No. 8 is generous. It is in the accumulation of these small good judgements that one builds up a picture of a company's values - so much more eloquent and unambiguous than mission statements. Anyone caring for these works needs to have these performances. They will remind you that Vaughan Williams is a composer whose music need not be passion-neutral. I have my fingers crossed that Dutton will be able to secure the licence to issue the tapes of Barbirolli in Antartica (the work he premiered) and with Philip Catelinet in the Tuba Concerto. 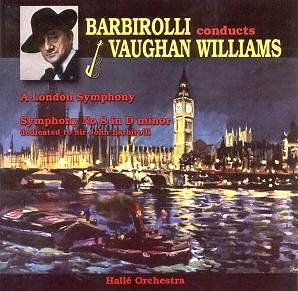 Other projects remain and are likely to remain fanciful dreams including the vision that somewhere out there a collector has some dusty but perfect tapes of Barbirolli conducting Bax 5 at Cheltenham and Bax 6 at the Proms. Both happened during the 1950s but to date no recordings have emerged.